Ready to head to the cabin? The Spring issue of Cottage Life West has expert advice and clever solutions to get you prepped for the season. Our opening up cleaning guide shows you how to clean away winter grime, rust, poop (and more poop!) from pretty much anything. A genius carpenter shares his secrets to a stunning sturdy deck that’s built to last. Get a peek inside the some seriously sweet cabins that are tiny, portable, and off-grid. Finally organize your workshop (and your junk drawer!) with tips from our experts. Try our disaster-proof recipes that feed the crew—no water or power required. We’ve got plans for two cabins that offer you and your guests your own space. 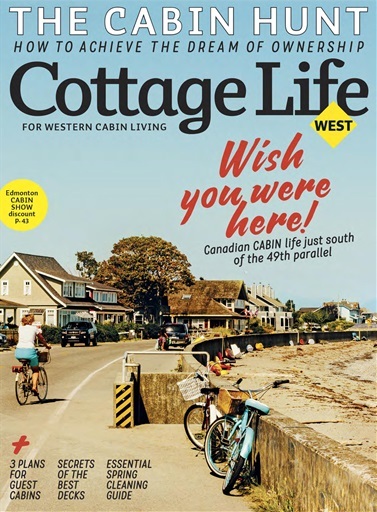 Get the scoop on the latest real estate trends with our annual real estate report—you might be surprised by who is getting into the cottage game! Plus, we’ll show you a town where you can still find affordable cabins and charming, quiet beaches. Everything you need to kick off your best season at the cabin yet is in our jam-packed Spring issue.